Get amazing color, high durability and the energy efficiency of LED, all at a great value, with these Kringle Traditions 5mm LED mini lights. Wrap these lights around trees and bushes, across cozy outdoor living spaces, or anywhere you want to add light to your holidays! 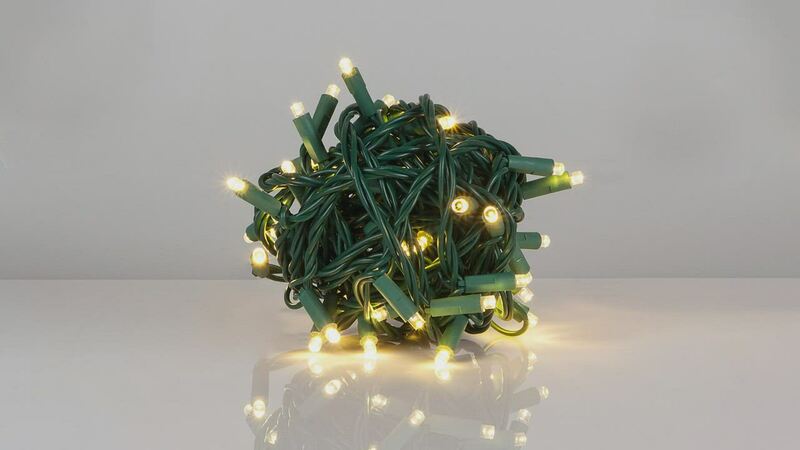 These lights are packaged in a ball to make them easier to unspool and wrap Christmas trees, outdoor trees, or anyplace a decorator needs a fast, efficient way to create large light displays. 50 Green 5mm LED lights spaced 6" apart on green wire, 25.2' total length. Bought these to re-string a large outdoor wreath. These bright LEDs are perfect and use almost no electricity. My 15 foot spruce is covered with 10 strands of green and you can see it from miles away. These lights are awesome!! Bright, pretty, and worked perfectly for what I need!! I will be ordering more!! Wish I could post pics!